By NBC Bay Area staff. Several people across the Bay Area have been arrested for driving under the influence this Memorial Day weekend as law enforcement personnel step up patrols during a maximum enforcement period. An 18-year-old driver was taken into custody for driving under the influence of both alcohol and drugs after the SUV he was driving overturned along southbound Highway 101 just south of the Robin Williams Tunnel in Marin County Saturday night, according to the California Highway Patrol. The driver, who has been identified as Angel Negronclay, and five passengers, including one who was sitting on another passenger's lap, reportedly crawled out of the SUV after the wreck, according to the CHP. Negronclay fled from the scene on foot but was later found. In addition to being arrested for driving under the influence, he was arrested for felony hit-and-run causing injury and driving without a license. The five passengers, ranging in age from 16 to 21, were treated at the scene and released, according to the CHP. While officers worked at the scene of the south Marin County crash and arrest, another CHP officer spotted a driver weaving in and out of their lane along southbound Highway 101 through Novato and later chucking beer bottles out of their vehicle, according to the CHP. The driver was subsequently arrested for driving under the influence and possessing open containers of alcohol in their vehicle, according to the CHP. 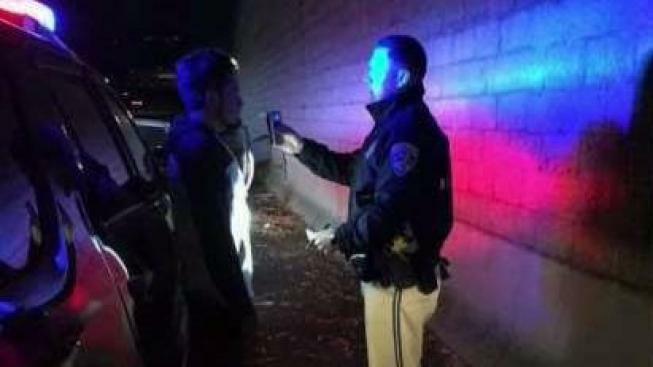 Later that night, CHP officers in Novato arrested another driver for driving under the influence after they found an open container of alcohol in the driver's vehicle, according to the CHP. Before the arrest, officers were checking on what they thought was a disabled vehicle along northbound Highway 101 at Delong Avenue when they discovered the driver and the open container in the vehicle. In the South Bay, a driver suspected of driving under the influence crashed early Sunday along northbound Interstate 880 near Bascom Avenue, sparking a blaze that engulfed the vehicle and nearby brush, according to the CHP. The driver suffered minor injuries, the CHP indicated.